Who are Bears & Butterflies? Bears & Butterflies was created by us – newlyweds Brook and Rebecca. We wanted stylish but affordable guest accommodation for our wedding but were unable to find quite what we were after. After a minimal amount of deliberation we decided to take the plunge and set up our own bell tent hire company. And so Bears and Butterflies was formed! Rebecca instantly hit the sewing machine (no bell tent is complete without bunting), while Brook hit the gym (well, those tents aren’t going to pitch themselves) and we can honestly say we haven’t looked back. We love it. Having travelled extensively we know what separates the amazingly unforgettable experience from the downright average. Crucially we also know exactly what is needed for a good night’s sleep. We pride ourselves on offering you a unique and personal experience. 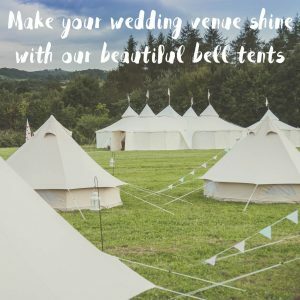 We know how stressful planning weddings and events can be so no matter what your requirements you can rest assured that we will do our utmost to ensure you are all happy campers. Have a browse around the rest of the site and drop us a line if you’d like a personalised quote or have any other queries.